The United Kingdom is an island nation located in northwestern Europe. It consists of England, Northern Ireland, Scotland, and Wales. Its deep history has a great impact across the world, from raging was of the nomadic people to the most popular pop culture icon of the century. England is the birthplace of the greatest literary genius, Shakespeare and the most popular band of all times, - The Beatles. Its capital serves as the main center for finance, fashion, and culture in the world. The UK is home to the famous Neolithic Stonehenge, ancient Bath’s Roman spa, and oldest universities in the world. The United Kingdom has four geographic areas- England, Wales, Scotland, and Northern Ireland. It consists of the most populous area of the British Isles. Its group of island composes of Ireland, Great Britain, and other many smaller islands. Wales, Scotland, England constitute the larger area of Great Britain. The Republic of Ireland and Northern Ireland play as the second largest island – Ireland. The southern part of Great Britain, England composes of Isles of Scilly to the southwest coast and Isle of Wight in the southern coast. In northern Great Britain, Scotland includes Orkney, Shetland, and the Hebrides. On the other hand, Wales on the western part of England includes Anglesey to the northwest. The forming of the UK can be traced from the Anglo-Saxon king named Athelstan. During the 10th century, there were allegiances of other Celtic kingdoms. The efforts to unify the neighboring kingdoms made him king as “the first to rule what previously many kings shared between them.” Over the course of centuries, kingdoms lying farther away from where ruled under the English domain. The congeries of Celtic kingdoms lying southwest in Great Britain became one nation under the Acts of Union of 1536 and 154 which was later called Wales. Scotland and Wales were then formally incorporated in 1707 to join the United Kingdom of Great Britain. During the 1600s, England took hold of Ireland and was formally united with the UK through the Act of Union of 1800. But in 1922, Ireland gained its independence in 1922. But nine other counties remained part of the UK which referred to as Northern Ireland. The “British” word became a common term to refer people to all the United Kingdom. Although efforts to have these countries unified and at peace, there are open rebellions and at some point leads to warfare. Various controversies marked the peaceful efforts of England. However, during the late 20th century, these tensions became fewer as assemblies and constitutional peace talks were introduced in Scotland, Wales, and Northern Ireland. Nevertheless, the tension still continued until the 21st century when the Northern Ireland’s unionists (those who favor British sovereignty) and nationalists (who wants to have unification with the Republic of Ireland) still hold political clash. It’s a common fact that the UK has one of the greatest contributions in the world especially in science, technology, and industry. Ever since the World War II, the most significant exports have been cultural, theater, film, television, and literature. But the greatest contribution to humanity of the UK is the English language. Britain’s language is now spoken to almost every part of the world and served as the top international mediums of economic exchange. Known as the “birthplace of reggae”, Jamaica is considered by many as a treasure of natural jewels on earth. Golden beaches lined with lush green mountains, raging seas, ancient coral reefs, and lively rainforest makes is a popular summer destination. Nature lover folks will find activities from hiking to bird watching in the jungle, to diving in the colorful reefs. Jamaica is also famous for its many historic plantations where tourist can taste it's abundant tropical fruits while touring the grand and great houses. Several of the tourist spots include Montego Bay, Ocho Rios, Negril, and Port Antonio. But Montenegro Bay remains as the top choice destination in Jamaica. While cruise ships regularly visit Ocho Rios, other people are busy exploring Ecoto in Kingston, where Bob Marley’s used to reside. Jamaica is a one-stop destination for all; from adrenaline junkies who seek thrilling adventure to nature lovers, and beachgoers. Leaving the island is never easy. That’s why some people visit museums and other historical places in Jamaica to bring something back home. 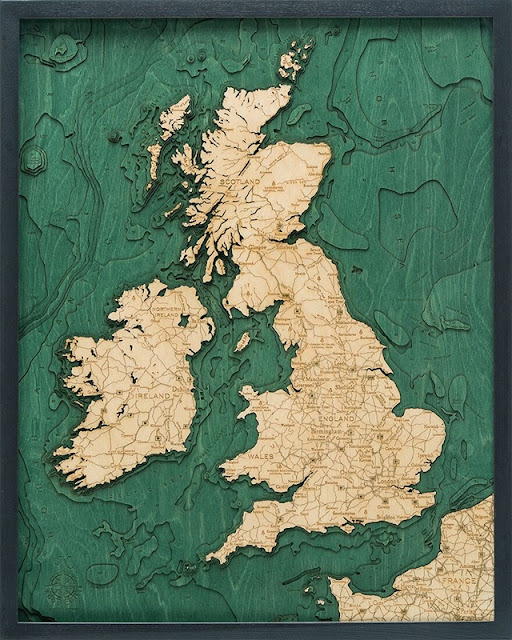 http://www.carvedlakeart.com/jamaica-wood-nautical-chart-map-p/jama-d2m.htm Check out carvedlakeart if you want the best deals on laser cut map, wood nautical chart in Jamaica, wood topographical map, and charts of the lakes, streams and oceans of the world. Port Antonio is the third largest port in Jamaica and one of the most important shipping point for both bananas and coconuts. The place has a tropical climate, hurricane season start from May to November. To get the most of your vacation, months of December to April are the best. Featured in many Hollywood films, it perceived as the ‘ideal paradise escape’ for its luscious rainforests and pristine beaches. Have a taste of authentic Port Antonio; visit the famous Bush Bar restaurant for a bit of ‘high-dining’ island style. Tourist stay at Ocho Rios to see the cascading waterholes called Blue Hole also known as Island Gully Falls or the Irie Blue Hole. The views are perfect for that epic Instagram post. Some adrenaline junkies climb up the hill to get an almost bird’s eye view of the whole area. For an experience of a lifetime, few dared to jump off cliffs down to the clear waters below. As the birthplace of river rafting in Jamaica, it’s a must to start your ride here – a place where they use to transport bananas from the plantation to Port Antonio. Around 1911, there was an abundant banana harvest traversing through the same passageways. Errol Flynn started the whole idea of rafting on the island as he challenged his guests in a rafting race one night. Since then, it becomes of the most popular things to do in the Rio Grande – at some point inspired other carnival ride for its unique thrill. It traverses through Berrydale or Grants Level and ends at Rafters Rest on the coast, it usually takes about two to three hours depending on your entry point. Situated in the mountains, and about an hour drive from Negril, Mayfield Falls is a destination itself. Nature lovers especially young couples would enjoy its seclusion. The place is like a heart of the rainforest with two breathtaking waterfalls, 44 mineral pools, 21 natural jacuzzis, and tropical greenery. Mayfield Falls houses different kinds of plants and beautiful blooming flowers. Take a break from your usual music preference and listen to the most soothing music of Mother Nature. Cross the wooden bridge going to Rasta Village and explore the heart of Reggae Style Mayfield Village as well as its local folklore. For anyone who wants to get their perfect tan, Negril Beach is one of the most beautiful beaches in Jamaica. Along the Caribbean’s best beaches, it’s lined with white powdery sand and crystal clear blue water. The beach stretches out from Bloody Bay to Long Bay and ends just near Negril Cliffs. If ever you get bored of the usual beach scene (which is impossible) there are also water activities. Snorkeling is a popular thing to do in this place because you don’t need to get that far to see schools of fish. During the 1920s, a famous British osteopath claimed about the curative powers of Montego Bay after dipping in its mysterious water. Words of its healing waters reached worldwide and started to attract visitors. Soon after the place was known as Doctor's Cave Beach but a strong hurricane devastated the area. Today, the place is a popular stop for many cruise ships. A visit to Jamaica is never complete without touring The Bob Marley Museum, the reggae superstar’s former home. Many tourists who visit Kingston always check the museum. The city is a big contrast to the paradisal view of Montego Bay, it can be gritty but some offers organized tours throughout the city. Go sightseeing where reggae was born; try to see the Trench Town Culture Yard Museum in the ghetto where reggae music originated. Most organized tours go about historic places like Devon House, and other museums including National Gallery and the Natural History Museum. To get to know more of Jamaica check out the National Heritage Park to explore its rich history. But to experience their world renown music, drop by Emancipation Park, if you are lucky you can get to see a free musical concert. Listed under UNESCO World Heritage Site, it boasts of unspoiled nature and preserved an important historical moment in the island. Taino, the indigenous people of Jamaica take refuge in the John Crow Mountains National Park. It’s filled with lush rainforest, coffee plantations, and more than 80 endemic plants. It’s a great way to be with nature while exploring Jamaica’s history. For a unique vacation experience, you might want to stay at the Rose Hall Great House. Built-in 1770 where Annie Palmer (the White Witch) used to live, it has an amazing view of the ocean as well as magnificent sunrise or sunset. The house was preserved with period furniture and fixtures. Beautiful it may seem the mansion hides a dark secret; some say her spirit still roams her house. Evening tours are popular because guests can stay for a handful serving of ghost sightings and tales of her. http://www.carvedlakeart.com/lake-ontario-wood-nautical-chart-map-p/onta-d3m.htm Check out carvedlakeart if you want the best deals on laser cut map, wood nautical chart in Lake Ontario, wood topographical map, and charts of the lakes, streams and oceans of the world. A tour in Ontario is never complete unless you taste their particularly popular ice wine. The gaining population and the limited production of ice wine makes one of the most sought-after souvenirs from the region. Lake Ontario Wine Trail begins from downtown Rochester and spreads across the very scenic view of Wayne County. The area is lined with wineries, art distillery, bed and breakfast, unique shops, and farm markets. Whether you wanted a guided tour or explore on your own, here are some of the wineries that hard to miss. They served splendid red wines, one of the best in Ontario. A great stop in any Niagara wine tour, they make exceptionally good wines. They served wines with great tasting pecorino cheese. Staffs are extremely friendly and well informed about their wines. Despite their extensive wine knowledge, they are willingly wanted to share those for beginners and amateurs in the art of wine tasting. It’s a great experience for anyone; not only you can taste the best wine but can learn a lot from this tour. As mentioned earlier, ice wine is a thing of Lake Ontario and the Ice House Winery served one of the best ice wine in the area. They really know pretty well the art of making ice wine and slushy – a particularly nice drink during summertime. Staffs are charming and sweet and will honestly answer your questions about their ice wine making, but not their secrets though. For people who just love wines but not into the more sophisticated or over detail part, this place is perfect. A casual winery that serves slushes and best drinks with generous servings will complete your journey in the up north. It’s a big winery with great restaurants, not to mention a very popular destination for wine trail tours. Peller Estates Winery & Restaurant is the epitome of good food, good wine, and excellent service. They have beautiful scenery with a romantic ambiance. Their food compliments their wine really well and for beginners, staffs are always ready to give a few hints of what goes best. They really understand the nature of their wine. With winemakers like them, food pairing is an easy task. Their desire for a perfect pair of food and wine never ends. This place offers fine dining that still joyful and approachable for everyone. Great wine tasting experience is a luxury that every wine enthusiast should try. Let them pamper you with their exceptionally good service, food, and wines. Most people who visited the wine trails of Lake Ontario rave about this place. They even let their guest see their Ice Room, where most of the ice wines are kept and well cultivated. This place has a picturesque winery and great tasting wines that are reasonably priced. Staffs are polite, courteous, and well knowledgeable about their own crafted wines. Even though their knowledge about wines is extensive, they are willing to impart those to other wine enthusiasts. As part of the tour, they will guest into their basement production facilities to see the how they make and process their wines. They have many different types of wines in various stages and explain how the tilting process affects the taste of their wines. Guests are welcome to taste these different wines. If you are a beginner in the art of wine tasting, it’s better to start from here so you’ll have some basic knowledge to grow from. The winery has a picture perfect location in Niagara on the lake trail. They have a very scenic vineyard with lots of photo opportunities. Because of their location, they have thematic events happening all year round. Staffs are friendly very knowledgeable about wines and all. People can’t get enough of their peach wine, which is served with a cheese platter. Don’t forget to walk around its vineyard to see its amazing view of the Niagara. https://www.carvedlakeart.com/mediterranean-sea-wood-nautical-chart-p/msea-d4m.htm Check out carvedlakeart if you want the best deals on laser cut map, wood nautical chart in Mediterranean Sea, wood topographical map, and charts of the lakes, streams and oceans of the world. The Mediterranean Sea is a completely landlocked body of water which has one narrow exit called the Strait of Gibraltar that connects it with the Atlantic Ocean. Its name is derived from the Latin word 'mediterraneus'; “medius” meaning “middle” and “terra” meaning “Earth”. The whole words can be translated to “in the middle of the Earth”. Ancient Roman people believed that the sea was in the middle of the Earth. The average depth of the sea goes about 4900 feet and the deepest goes beyond the point of 17000 feet. Because of its depth, it’s only worthy enough to be named in which experts called it the Calypso deep located near Greece in the Ionian Sea. For millions of years, the Mediterranean Sea fascinates people and some of the most influential nations in the world originated near its shorelines. Archaeological relics found at the bottom of the Mediterranean Sea proved that several ancient civilizations formed near its waters. The sea has a major influence in forming these civilizations up to the modern times. Even today, the sea greatly influences the lives of more than million living in the Mediterranean region. Known for its deep blue color, the Mediterranean Sea has the most interesting facts that still fascinate experts. The Mediterranean Sea has a particular oval shape which lands on three continents – southern part of Europe, Western Asia, and North Africa. The Mediterranean Sea is so vast that has two subdivisions – the Eastern and Western region. The division borders from Sicily to Tunisia and the ridge is called the “Strait of Sicily”. By that, some of the most influential and powerful nations in the world surround the Mediterranean Sea including Egypt, France, Greece, Israel, Italy, Lebanon, Libya, Morocco Spain, Syria, Tunisia, and Turkey to name a few. Within these nations, the only independent countries in the Mediterranean region are Cyprus and Malta. The rest of the nations are known as the Mediterranean States. As a landlocked sea, the Mediterranean Sea has unique natural phenomenon occurrence on Earth. Some of its characteristics are rarely seen in other parts of the world. The waves and tides are relatively calm compared to other places. The climate within the Mediterranean region happens to be a subtype of the subtropical climate; mostly wet, with chilling winters and hot summers. But the deep blue waters of the Mediterranean Sea almost never happened. Around 5.96 million years ago, the Mediterranean Sea almost dried up in an event called “Messinian salinity crisis”. The crisis was so severe that it lasted for about 63 thousand years. Then a miracle happened, the event ended when the Atlantic flooded the world during the Zanclean flood. Many can find submarine karst spring can be found in many places along the coastal regions of the Mediterranean Sea. These springs released groundwater that is highly pressured and sometimes hot, which attract tourists to visit the region. Ever since time immemorial, the Mediterranean Sea played a significant role in commercial trading and diversifying cultural inheritance. Some of the countries ended up trading more than herbs and spices back during the ancient times, they shared most of their cultural heritage to some of the nations around the Mediterranean Sea. These nations took advantage of the bountiful harvest of the sea and in return keep its pristine condition as much as they can. Significant ports on the European region includes Barcelona, Durres of Albania, Genoa, Malaga, Marseille, Monaco, Naples, Nice, Palermo, Palma of Spain, Split of Croatia, Toulon of France, Valencia, and Venice of Italy. Their counterparts in Asia are Antalya of Turkey, Latakia of Syria and Tel Aviv of Israel. Meanwhile, some of the largest and most important ports in the African regions are Alexandria of Egypt, Tripoli, Benghazi of Libya, Algiers of Algeria, Tangier of Morocco, Tunis of Tunisia, and many more. Despite its size, the Mediterranean Sea has high levels of endemism; experts estimated about 20% to 30% of its species. It even has more endemic species than the vast neighboring Atlantic Ocean. These species including fishes and other marine animals are not found anywhere else in the world. Some endangered species take refuge in the Mediterranean Sea, species like the green turtle, loggerhead turtle, and monk seal. It may be a surprise for some people to know that whales and dolphins do thrive in its waters. However, many scientists now considered the pilot whale and the fin whale as engendered marine animals. Being a landlocked body of water, it’s both a blessing and a curse to the Mediterranean Sea. Its pristine beaches and crystal clear water are incomparable to others. But it also adds to its sad woes; with little to no escape route, anything that gets dumped into its water, stays there for years, even millennia to recover from. It’s a sad realization that most people don’t realize. Land-based activities contribute to the 80% of Mediterranean Sea’s pollution according to the United Nations Environment Programme (UNEP). Along with it, the sea is being threatened by marine transport by-products and overfishing. Fortunately, there is still hope to save the waters and the marine animals in the Mediterranean Sea. Many people pro-actively rally against the abuse and threats of its deep blue waters. There are many conservation groups across the Mediterranean. The World Wildlife Fund (WWF) is one of the most prominent groups protecting the Mediterranean Sea. The interesting Italy Facts which were studied and developed were the important history of its country and serves as a legacy in the world. The Population is more than 61.6 million people live in Italy 2016 onwards its capital is Roma (Rome), which is called 'Eternal City', with 2.6 million of inhabitants and Italy’s biggest city. The Repubblica Italiana (Italian Republic) or Italia, Nickname: 'Bel Paese' which means beautiful country. The country possesses a Democracy, Republic in terms of government, locals speak many dialects spoken such as Italian, German, French, and Latin in some regions in Northern Italy. The citizens are literate with more than 98% can read and write, and their main belief as their religion is mainly Christians (Roman Catholics 90%) with the money currency, 1 Euro=100 cents, before 2001 Italian Lira as its high standard value of living. The country has a rich history and heritage, as Rome its capital city today was founded in 753BC. When the Roman Empire broke down in 395 AD, the kingdom was divided and formed city-states. 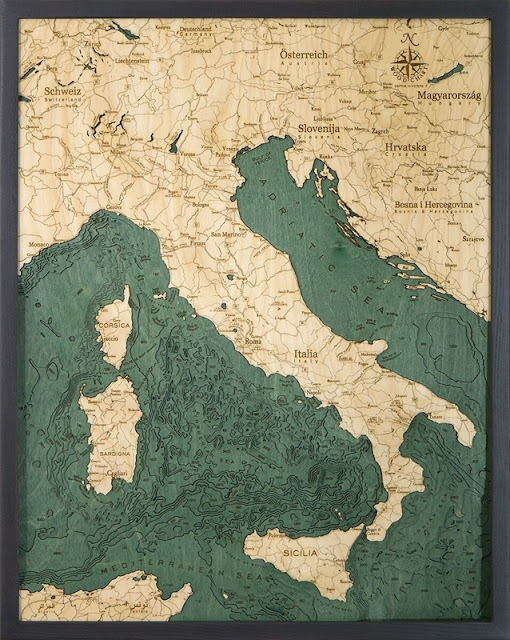 http://www.carvedlakeart.com/italy-wood-nautical-chart-map-p/ital-d5l.htm Check out carvedlakeart if you want the best deals on laser cut map, wood nautical chart in Italy, wood topographical map, and charts of the lakes, streams and oceans of the world. In 1861, Italy becomes one nation and incorporates the islands of Sicily and Sardegna. The colors of the represent these virtues: hope (green), faith (white), and charity (red). The country looks like a boot kicking a ball – the island of Sicily. Italy measures about 7,600km (4,722miles) of coastline as the large part of the peninsula is situated in the Mediterranean Sea. It has two largest islands Sicily and Sardegna and many smaller ones such as Capri, Elba, and Ischia. Along North, the mountain range of the Alps separates Italy from the other European countries France, Switzerland, Austria, and Slovenia. The country has many hills and mountains. The most beautiful mountain can be found in the Italian Alps which are the mountain range in Italy's north. Monte Bianco, better known as Mont Blanc, measures about 4,807m or 15,776 ft. There are many long and deep wonderful lakes situated in the North of Italy, which attracts many tourists to see its unworldly beauty. Volcanoes are very much active in this country as there are three of them – namely Vesuvius near Naples, Etna on Sicily and Stromboli off the Coast of Italy. It has one of the unique geographical locations, as it surrounds two of the world’s smallest country. It surrounds by two of the world’s smallest countries of the world. These are San Marino in Northern Italy, one of the oldest republics in the world and the Vatican City, main capital of the Roman Catholic Church all over the world. Some of the world famous artists were born in Italy like Michelangelo, Leonardo de Vinci, and Raphael. No wonder that Italy is the place to be to study art and ancient history. Tuscany is known for its countryside scenic view with lots of wonderful towns and villages. Italians are famous for inventions and discoveries. The Italian explorers Christopher Columbus and Amerigo Vespucci discovered the Americas. Another explorer, Marco Polo explored the Eastern boundaries of the world. Leonardo da Vinci was the best scientist and artist who first to prove the world is round, which became a common knowledge even before the modern world was able to prove it. They are one of the societies who pioneered in experimenting electricity spearheaded by Alessandro Volta. The Alps is probably the greatest place on earth to go skiing, hiking, and just literally chilling in its natural beauty. Try to visit Bolzano’s Natural History Museum with Oetzi, the mummy from the Ice-age era. Kids of all ages would love to see and learn something from the past. Italians love sports. Cycling, Skiing, Soccer and Motor Racing, you name it, they have it. They have a very strong interest in and good teams of sportsmen. Of all things, Italians treasured their families the most, where there are still many families including extended family in the household close to one another. As a country full of diversity, Italy is a country rich in languages. Italian is a language which comes from Latin and its original roots are interesting to study even up to now. However, not all resident can speak proper Italian but can speak other important Italian dialects. The people are rich from their original culture of dialects. Older people can only speak the local dialects and even German especially in the Northern region of Alto Adige. Others from Valle d’Aosta speak French while most speak Latino in Trentino. The voice is soft and very melodic and is sweet to hear and so is still used in opera and is produce by lovely young musicians, even German composers of songs used the language in opera as it sounds much softer than German because the people are known for their modesty and sweetness. Italians love their food and cooked many good dishes which recipe came from “Mama”. But more and more men love to cook and want to learn how to cook for their families. It’s a good break away from the typical image of the Italian "macho" and it helps them bond even more with families during reunions. Italian cuisine transformed the modern world for they invented some of the dishes that the world can’t live without. The Italian main dishes are well-known foods that contribute to the world. Its main ingredients include pork, beef, seafood as well as potatoes, rice and pasta (wheat and egg noodles) products and of course, tomatoes. Italians love their food and many dishes are based on fresh vegetables and seafood for healthy living. There are delicious sweet cakes in Italy, like the Panettone (a yeast cake with raisins), Panforte (a hard and flat fruit cake) and almond pastries like amaretti as their specialties. But the world will be forever thankful for pizzas, one of the most famous and delicious exports and in Italy. Usually baked in a wood-fired oven and very thin, but loaded with fresh vegetables or thinly sliced ham, salami, artichokes or olives and other spices. Italy is a great country to become one of the most riches in history, foods, tourist spots and rich in heritage or historical legacy. It is an enjoyable place to be. The Mediterranean Sea surrounds 23 countries in total including some of the most powerful countries in the world. Apart from their contributions to humanity, they have the most beautiful shorelines in the deep blue sea. Turkey, Spain, Cyprus, and Greece are just some of the holiday destinations that stunned the world for its amazing beaches. Countries in the Mediterranean coastline has idyllic beaches, each has something different than the next. As they are hundreds located in the Mediterranean Sea; from the majestic golden beaches off Turkey to the dreamy pink and pure white sands of the Greek islands, one thing remains common among these beaches, they are astoundingly beautiful. And all are waiting to be discovered. What would be a perfect getaway than to have a luxurious holiday in these pristine beaches? Spend some time relaxing in its different colored sands underneath the perfect blue sky. Here are some of the popular holiday beach destinations in the Mediterranean Sea. As the name implies, this place is the favorite beach destination of Cleopatra, the face that launches a thousand ships. And it’s easy to see why; it’s the most beautiful beach in Alanya. According to the mythology, Egyptian named Queen Cleopatra who traveled the Mediterranean and stopped in the area and had a swim in its deep blue waters. The beach is famous for its super clear water; one that can easily view the marine life under its waters. It’s a gorgeous place almost paradise according to most people who travel in this place. Kleopatra beach is a paradisal place with an amazing view of the castle of Alanya with great bars and organizes water recreational activities. A holiday spent in Crete will never be complete without a trip to Elafonisi Beach. Its crystal clear waters and watercolor pink sand is worthy of an epic travel. A really beautiful hidden gem in Crete, it’s a destination itself. Rocky and winding roads will greet you on the way to this place. Don’t let it stop you from going, even though the bumps in the travel is a bit of a challenge, the very scenic road will entice you for price waiting at the end of the journey. Elafonisi Beach will greet you with small rocky beaches and a trail that will lead you to a protected area. Located about 56km northwest of Chania and 17 km northwest of Kissamos, world-renowned lagoon of Balos is the most photograph beach in Crete. Famous for its idyllic sapphire and turquoise waters, it is also referred to as beach lover’s paradise and a favorite among tourists. Thousands of people flock the beach arriving by the ferries from Kissamos port. It really gets crowded as the beach gets packed during the months of July and August. If ever you did travel to enjoy the lively crowd, then walk in serenity in the early morning before the boats arrive from Kissamos. Iztuzu beach is a nesting site for the endangered Loggerhead Turtles thus calling it as the Turtle Beach. It’s considered as the second most important site for the endangered species. Iztuzu is one of those few beaches on earth that preserved its original beauty; 5km of golden sand underneath a forested mountain without a single shop or house in sight. Because of the preservation efforts in the area, many would come here to enjoy a full day of relaxing swimming. Its location is a great holiday destination for families and young couples. This beach is a perfect destination for people who love to party but still enjoy a quiet time at the beach. The area just a few miles at the lively Ibiza but still can have intimate time with their loved ones. There nothing special about the beach, nothing much of the high-end amenities compare to other beaches, but it’s captured the hearts of many because of its secluded charm. Its pure white sands and pristine glassy tortoise sea will let you remind that paradise does exist. It won’t be a problem going to this beach as there’s a public transport service and the nearest bus stop is only 500 meters away from the place. The United Kingdom remains as one most powerful and influential not to mention the richest countries in the world. Their early beginnings helped shaped countries surrounding them; it’s amazingly rich and yet controversial but very impressive story to tell. It’s great that it inspired most children’s bedtime stories and modern day films. There are so many interesting stories and facts surrounding these great nations. Here are some of the little-known facts about the United Kingdom and the rest of Great Britain and more of England’s history. The United Kingdom of Great Britain and Northern Ireland (UK) comprises of the UK including Great Britain and north-eastern part of Ireland and many smaller islands. Great Britain consists of three countries; England, Scotland, and Wales. To the west, Ireland comprises of Northern Ireland, the Irish Republic and many offshore islands with the largest lying just off Scotland. The UK is a huge country measuring 242, 500 square km or 93,600 square mi. Interesting enough, it just 113 km or 70 mi from the sea. The longest mainland distance is from Land’s End in Cornwall to John O’Groats in Caithness that stretches about 870 mi. People regularly walk the distance for charitable causes. Because its proximity to the sea Scotland is known to have a famous monster called Loch Ness Monster that fascinates many people. Referred to as Nessie, it’s suspected to dwell in Loch Ness, the largest lake in the region. Even though it’s considered as mythological, many claimed to have witnessed the monster over the past decades. But during ancient times, the British Empire was the most extensive in the world. At one point in time, it ruled an estimate ¼ of the world’s total population and expands about ¼ of the earth’s total land area. From the northern part of Ireland to south of the globe, in New Zealand, the British Empire ruled for centuries. As there are many countries in the UK, accents vary from one place to another. How vast is the UK? The accents noticeably change every 40 km or 25 mi. The UK has more cities than in any part of the world despite its relatively small area compared to some countries. There are 69 official cities around the UK; 5 in Northern Ireland, 6 in Wales, 7 in Scotland, and 51 in England. In the ancient times, there are two universities in the UK, Oxford and Cambridge, two of the most prestigious university in the world. They remain so until 1832, but their reputation remains very high to this day. Now, there are more than 100 universities around the United Kingdom. From the well-known ‘red-brick’ universities scattered in major cities to specialist colleges that have upgraded to university status over the years. Education was not the only one that the UK contributed to humanity. The UK brought several famous sports to the world like rugby, soccer, and polo. The British are known to be passionate about these sports and the nations under them. Another prominent structure in the UK, Stonehenge is older than the Pyramids. The famous tourist attraction located in the south of England was built around 3000 B.C. The UK was the first ever country to use postage stamps. In May 1840, the first stamp used was known as the Penny Black. Today, many collectible stamps have Queen Elizabeth drawn to it and using it upside down is considered as treason. The Windsor Castle located in the English county of Berkshire is the oldest royal residence in the world. Queen Elizabeth and the rest of the royal family still lives and use the castle for formal occasions. Queen Elizabeth II does not hold a passport but had visited 116 countries in the world. She doesn’t need one as she herself officially issues passports for British citizens. Prince Charles is the distant relative of the notorious Romanian ruler, Vlad the Impaler according to the Romanian National Tourist Office. Vlad the Impaler ruled during the 15th century and inspired Bram Stoker to write the famous Dracula novel. His daughter-in-law, Kate Middleton is related to another famous person. She was the 8th cousin seven times removed to the first President of the United States, George Washington. It’s true; the British do love their tea. They consume more than 165 million cups of tea each day – 20 times more than what the Americans drink. But it’s not the only thing that the British are peculiar of, 85% of the British people want their food free from pesticide. The date came from the leading organic food campaign, the Soil Association. It might be a surprise for some people but the UK has the largest Indian restaurant in the world – more than the actual restaurants in Indian cities like Mumbai and Delhi. With a history as extensive as the UK, is appropriate enough to have all the recordings of it. Rightly so, the British Library in King’s Cross London has more than 170 million books in its catalog. But a trip to the UK is really complete without first knowing J.K. Rowling and the wizarding world of Harry Potter. Rowling is the first billionaire author and sold more than 400 million copies of the Harry Potter series which was translated over 50 languages around the world. She once lost her billionaire status due to her many charitable causes. One can tour the UK, as there are lots of tourist attractions and interesting structures that has deep historical roots. But whatever happens don’t you die in the Houses of Parliament as it’s against their law.